When I think about about concrete, I usually picture a bunch of hairy bros whistling at attractive women walking across the street from their worksite. Have I ever actually witnessed this? Not really. That's just what comes to mind. But concrete isn't just material used on sidewalks and parking structures—it can also look really awesome right in your living room. I wouldn't have thought that a concrete lamp would look great over the kitchen table, but it does. 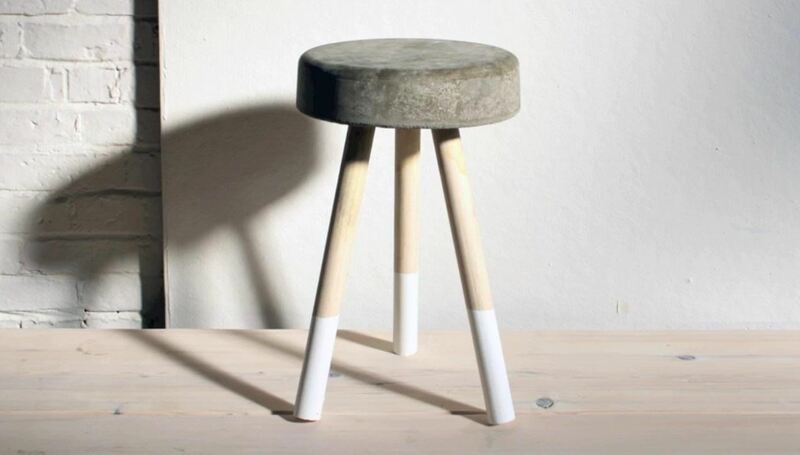 And this concrete stool, created by HomeMade Modern's Ben Uyeda (who also made that lamp), would make another great addition to your interior. 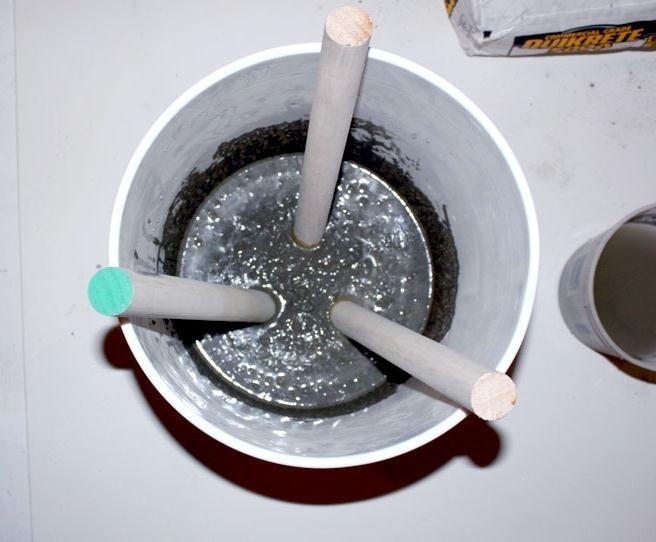 All you need is a 5 gallon bucket, fast-setting concrete mix, three 1¼" diameter wooden dowel (48" long), and water. 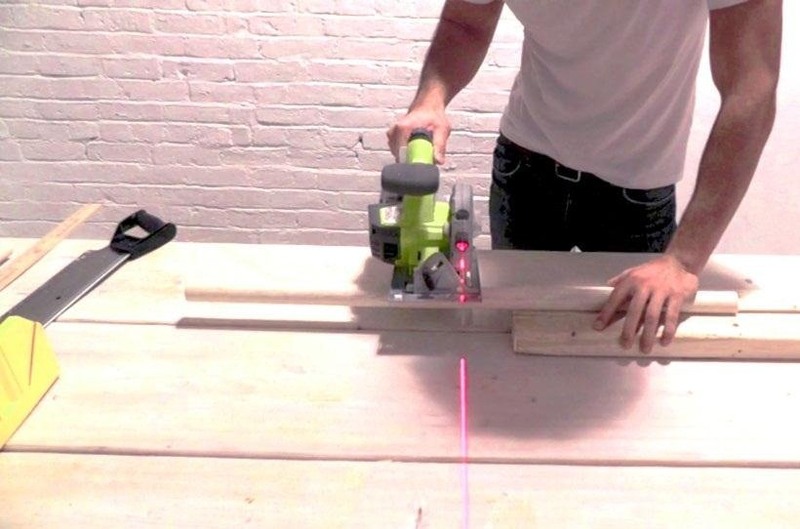 First, you're going to cut down that wooden dowel into three 16-inch pieces. Since I prefer my stools a little taller, I would probably opt for a longer dowel, but you can make them any length you want. Once you have the wooden legs cut, set them aside for now. Slide over that five gallon bucket and put in three inches of concrete mix. Add water and stir until you get all of the grains out. Now, tap and lightly shake the bucket to remove the air bubbles trapped in the mix. Grab the wooden legs and place them directly inside the mix, letting each leg lean against the side. Once the concrete is set (about 20 hours later), you should be able to pull it right out of the bucket. The concrete can now be sanded down for a smooth finish. 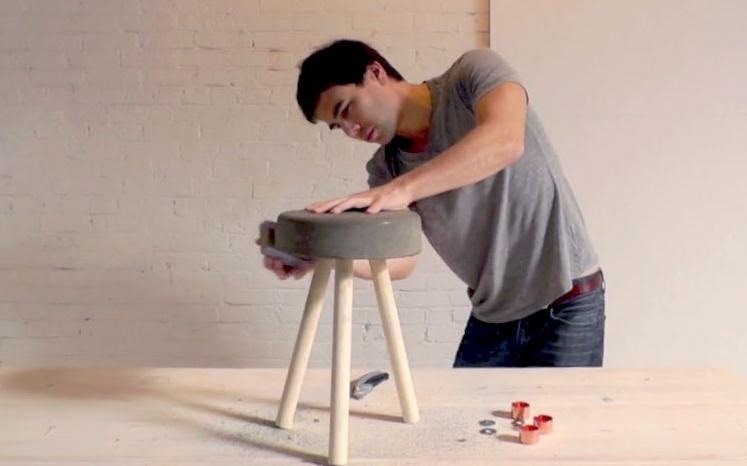 Your concrete stool is complete. Who knew five dollars could do so much! Check out the video to watch the process. Ben dip-dyed the legs of his stool, but you can skip that step if you prefer the minimalist look. For some more optional additions and images, be sure to check out the full tutorial over on HomeMade Modern. How To: Make a Stool from Recycled Wood. I'm also LOVING this concept but would like a taller version (ie. a bar stool). Could you use a thicker wood and make them taller? #1 thats not concrete; its cement. Portland cement, to be precise. #2. If you don't add some type of metal reinforcement, it's going to come apart. #3. You'll need to coat the inside of the bucket with some type of oil, or it will bond to the plastic bucket. I liked the idea but have variation in my mind, don't you think it will be quite heavy to move by ladies? Awesome idea I have been looking for some cheapbarstools or a way to easily make some, I am totally doing this. I am going to use thicker wood, maybe more natural raw looking branches or something, make them taller, and maybe wrap some rope around the legs a fewti es for stability and also as a foot rest. Thanks heaps for this idea.